Not your average elementary school 'show and tell': 'toy' grenade detonated by police in Rishon Letzion. In an apparent case of "fire in the homeroom," a tear gas grenade was found at an elementary school in Rishon Letzion, a coastal city just to the south of Tel Aviv. It is suspected that a girl in the third-grade brought the explosive device to school two weeks ago, where she proceeded to play with it in the schoolyard, reports Yedioth Aharonoth. 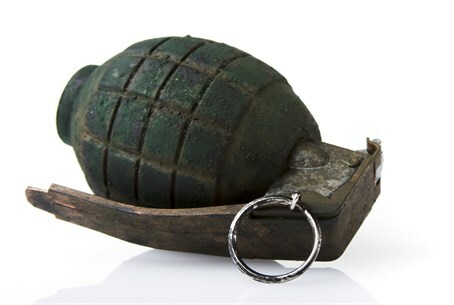 The grenade was reportedly confiscated by a school teacher, who placed it in a closet in the elementary school. Rishon Letzion police forces performed a controlled detonation of the grenade, and launched an investigation into the incident. It remains unclear how exactly the third-grade student got her hands on the grenade. The case brings to mind another incident of civilians "playing" with grenades last month, when a Tzfat resident in his 50s was suspected of attaching a stun grenade to his neighbor's motorcycle. The neighbor found the grenade after he fell while riding the vehicle, although the grenade did not explode in the fall, and no injuries or damage were reported from the incident. Police said the event appeared to have stemmed from a conflict between the two neighbors in the northern city. In December of last year police confiscated a handgun from a 10-year-old boy in the northern Israeli city of Beit She'an. The child claimed the .22-caliber pistol had been given to him by one of his relatives "as a present".